In 2013 Duffy was voted as one of the top most 100 influential photographer’s of all time and he richly deserves that title. When Duffy felt he had pushed the boundaries as far as he could and was no longer satisfied with stills photography he abruptly shut his studio, attempted to burn all of his negatives and moved into commercials. Despite repeated requests to return to still photography, give interviews or discuss his career, he became reclusive and his remaining negatives would have stayed in boxes under the stairs had it not been for the persistence of his eldest son, Chris. Chris realised that Duffy’s name was slowly slipping into obscurity and regularly tried to persuade him to do something with his remaining archive. It wasn’t until 2006 when Duffy was diagnosed with the degenerative lung disease Pulmonary Fibrosis that he finally gave Chris the green light to start putting the archive together. The process was a labour of love for the first few years. 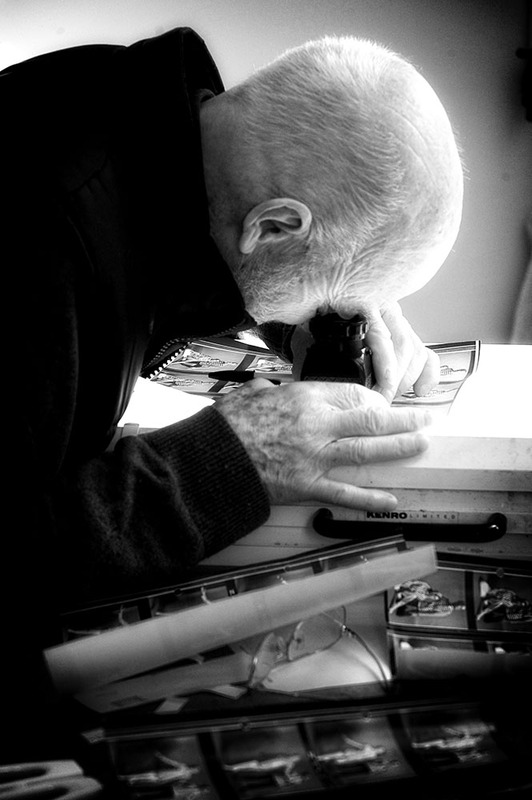 Organising, scanning and databasing his negatives took many hours whilst Chris was running his own photographic studio. In 2009 the opportunity to exhibit at Chris Beetles Gallery in Mayfair London (now Beetles & Huxley) gave Duffy the platform for his first ever exhibition which was hailed with great critical acclaim. The exhibition ignited an incredible interest in his work and there were regular queues to see the show. During the process of putting the exhibition together, the BBC commissioned a documentary on Duffy’s life and work which aired in 2010. 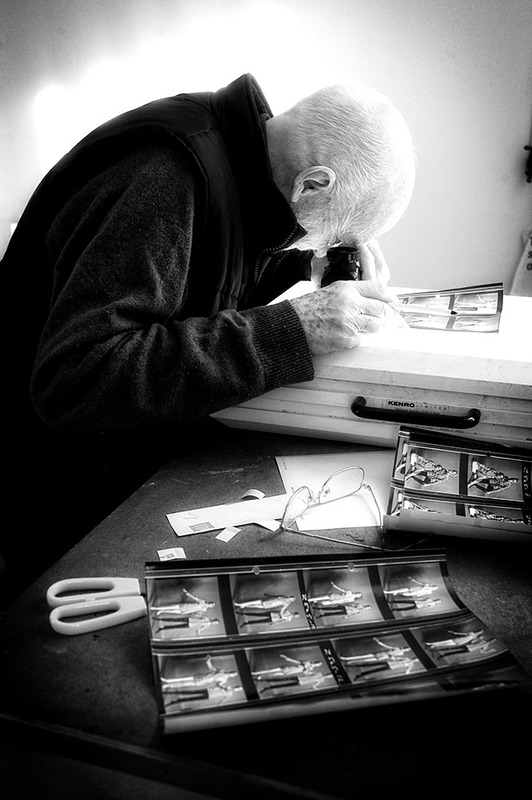 Chris then started on the first monograph but sadly Duffy was never to see this and passed away on 31st May 2010. Since 2010 Duffy’s work has been exhibited in numerous museums and galleries around the world. In 2012 the Victoria and Albert Museum requested use of the original Aladdin Sane record cover ‘dye transfer’ print for their British Design 1948-2012 cultural exhibition. In 2013 the V&A approached the archive for use of the newly released ‘Eyes Open’ version as the lead image for the ‘David Bowie is’ exhibition. This exhibition has achieved record breaking numbers in several venues and has been seen by over 1.5 million visitors. Duffy’s name has now become recognised by an international audience and is now firmly back on the map. In 2014 Duffy’s second book was released – Duffy Bowie: Five Sessions which covers his work with David Bowie. Written by Chris Duffy and Kevin Cann the book explores the chemistry and creation of these five iconic sets of images illustrated with interviews from people who were directly involved. The book is also available in French and Italian. The archive is made up of negatives and contact sheets that have been retrieved from numerous UK and international publications; Vogue, French Elle, Glamour, The Sunday Times, The Telegraph to name but a few in addition to work held by independent archives. The process of exhibiting Duffy’s work continues and the future holds several more book projects illuminating Duffy’s eclectic and influential work. The Duffy Archive was established by Chris Duffy. Publication of first monograph “Duffy Photographer” Published by ACC Editions features over 160 iconic images from the 1950s, 1960s and 1970s and in 2011 the V&A Museum London requested Duffy prints for their permanent collection. Solo Exhibitions and contributions in Italy, Paris, Amsterdam, Spain, San Francisco, Los Angeles, New York, London and Australia. See Exhibitions section for more exhibits. David Bowie Is launched at the V&A Museum with Aladdin Sane as the lead image. Also named as one of one hundred ‘most influential photographers of all time’ by the British Journal of Photography. See Exhibitions section for more exhibits. Publication of Duffy / Bowie – “Five Sessions” Published by ACC Editions. Publication of French Elle – “In The Eyes of Brian Duffy” – Published in French by Glenat. David Bowie Is V&A Exhibition goes on tour to: Sao Paulo, Berlin and Chicago. See Exhibitions section for more exhibits. David Bowie 'Is' continues to tour Paris, Australia and the Netherlands. See Exhibitions section for more exhibits. David Bowie 'Is' continues to tour Italy and Japan. See Exhibitions section for more exhibits. David Bowie 'Is' reaches Barcelona. The Archive also contributed to Holden Luntz Gallery Exhibitions - "Under The Bright Lights, Fashionable Moments" and "The Art of Sound and Movement" In Florida. See Exhibitions section for more exhibits. David Bowie 'Is' Tour reaches Brooklyn NY - Bowie's home town - And reaches the incredible milestone of 2 Million visitors. Chris Duffy is the son of legendary 60‘s British Photographer Brian Duffy. From an early age a camera was in his hands and he had the influence of his father’s friends and peers; David Bailey and Terence Donovan with their numerous debates on photography around the kitchen table. It was inevitable that photography would have a huge influence on Chris’s life. He is perhaps the only person to have assisted all three photographers nicknamed by Parkinson as ‘The Black Trinity’. At 17 Chris began work as a Trainee Processor in a photo lab but after a year started assisting Duffy as a Third Assistant quickly working his way up to Studio Manager. Chris worked and traveled the world with Duffy for nearly seven years and in 1979 established his own studio. During the 80’s Chris worked as one of the top music photographers (Bowie/Adam Ant/Steve Strange/Sade/Spandau etc.) as well as numerous other commissions covering a wide range of genres. Chris later moved into shooting moving images forming a film production company with Duffy and were successful shooting both commercials and pop promos. In 2005 Duffy was diagnosed with a degenerative lung disease and Chris finally persuaded him to start work on establishing an archive. Together they sifted through all of Duffy’s remaining photographic material and selected and printed modern edition prints with the intention of exhibiting and producing books. Sadly Duffy passed away in May 2010 but Chris has continued to build the archive and Duffy’s work is now exhibited by museums and galleries around the world and is highly sort after by collectors. Chris continues to shoot his own work outside of commercial restraints, he promotes Duffy’s work on a world stage and is a well regarded speaker. Sandie started her travels working for the Qatari Royal family, later moving onto a career which took her around Europe and to the USA. As a trailing spouse in several locations including Egypt, Kuwait and Azerbaijan she used her business skills as a fundraiser and organiser of charitable events. Sandie met Chris in 2009 in time for the very first exhibition Duffy’s photographs at the Chris Beetles gallery and prior to the screening of the Duffy documentary ‘The Man Who Shot the Sixties’. Fortunately she got to know Duffy for the last eight months of his life which has held her in good stead to be able to enthusiastically embrace Duffy’s work. Sandie is usually the first point of contact and she covers sales, marketing and manages the growing Duffy Archive Instagram account. She also makes tea. 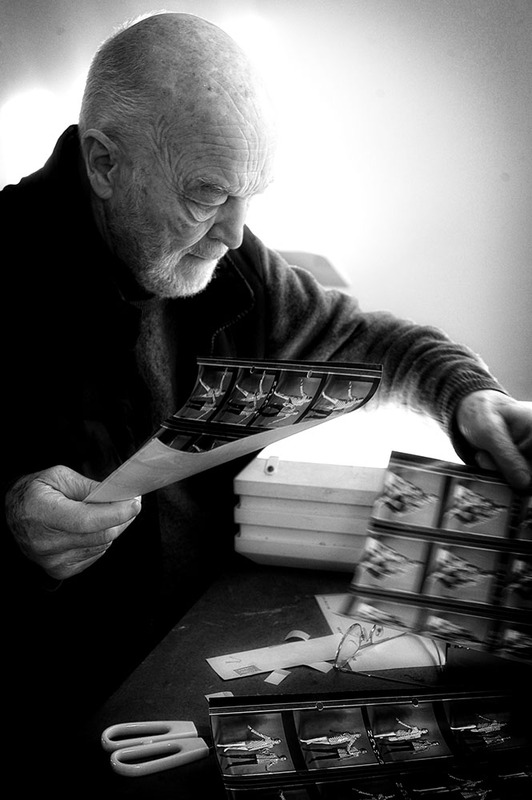 With a history in photography, videography and music – the Duffy Archive is a perfect fit. Spending time on both sides of the lens photographing and filming touring bands and festivals as well as working as a musician independently and in bands for over 10 years covering all styles from original film scores to musical youth charities. Winning a young photographer of the year award sparked Oli’s interest in media which he followed through college and university. After a few years of travel, touring, working in record stores and founding a media company He started working for one of the UK’s largest audio companies. Oli started working for Duffy Archive in 2017 part time which quickly developed into the Production Manager role. This covers the printing and creation of new products, shipping, packing, scanning and general day to day running of the Archive.